Now you can get lost in Derek Jeter’s eyes … like, literally. 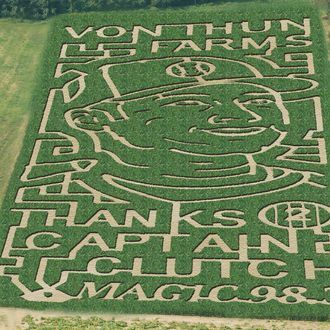 VonThun Farms in South Brunswick, New Jersey, carved the retiring Yankees’ face into a corn maze, which is slated to open September 20. Alongside Jeter’s mug is a message that reads, “Thanks Captain Clutch,” which we assume is some kind of sports reference. According to NJ.com, the maze also features a pumpkin called “Spookley” who’s stationed to deliver anti-bullying messages to kids. Kids, beware: There is truly nothing spookier than getting trapped in a field of corn by a middle-aged man dressed as a pumpkin talking to you about why cyberbullying is mean and bad.